A Mama Peregrine Falcon keeps a close eye on her chick as he learns to fly. 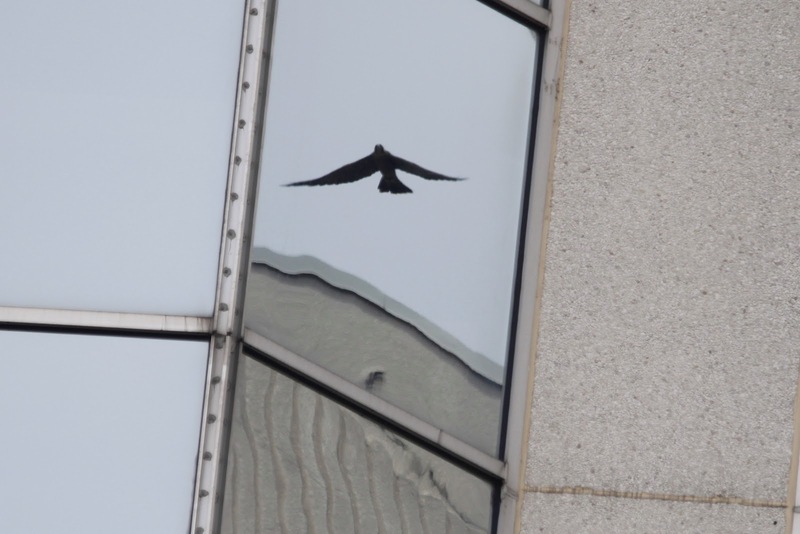 Reflective windows kill millions of birds every year, it's a fact. I started volunteering for an organization earlier this year called FLAP. Every year during spring and fall migration volunteers comb the streets of Toronto picking up dead birds and looking for injured ones to save after window collisions. I knew it would kill me to do that, so I volunteered to input data, and trust me, even that gets to me sometimes, so many dead birds, in my opinion, needlessly. Put a special coating on the window and the problem is solved, the birds no longer think it's "open space" and they won't try to fly through it. You can read more about the wonderful organization, FLAP here. I also volunteer for the Canadian Peregrine Foundation, as does Rob. We do a few different things; help out at events when needed, pitch in at the barn where the educational birds for the organization live, and also help with "fledge watch". When a Peregrine Falcon first learns to fly, they aren't very good at it. They end up on the street, get stuck on balcony's, basically they can get into all sorts of trouble, so volunteers keep an eye on them, all day long, and rescue them when needed for close to 2 weeks until they know the young ones have finally mastered their wings. 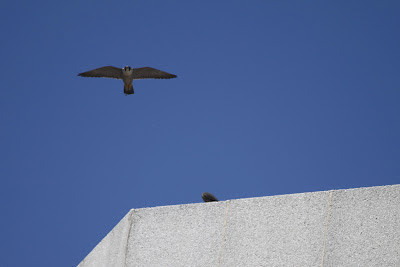 Peregrine Falcons are on the endangered species list and are a protected bird, most buildings where they choose to nest and the people in the area to a nest site are very interested and accommodating. Tonight my FLAP & CPF worlds collided, and it broke my heart. 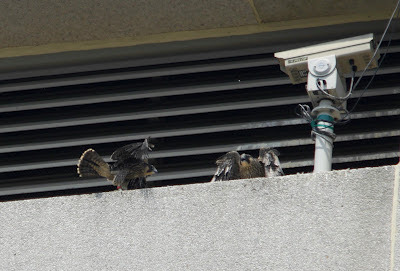 There is a nest site close to our home, and Rob and I try to help out with fledge watch there. Rob has been spending much more time there then me, as his shift allows for it. Still I try to go down when I can, like tonight after work. Tonight I watched in horror as a young Peregrine Falcon went to fly up onto the nest ledge from another building to meet her Mom, but instead she collided with the reflective glass below, not even realizing it was there, because it looks like open space to them. We heard the awful thud as she collided head first, and watched her spiral down to the lower roof top below. The Mother falcon flew down after her young, calling. Frank and I immediately crossed the street into the building to get security to let us out to the roof top. The minutes seemed like hours, but finally after lots of ladder climbing I reached the bird, but she was gone, the hit was too hard. Reflective glass takes another one. The thing that really pisses me off about this, is that the Sunlife buildings at the corner of Islington and Bloor make a big deal about the falcons nesting there, they even hold an event there when the chicks are banded. You'd think they'd want to do something to help them survive. It makes no sense to me. If you knew birds were going to hit your buildings and die, the question I ask isn't only why aren't you doing something to prevent this, but why wouldn't you want too?! These birds have enough obstacles in their lives, needless window collisions shouldn't have to be another one. I have my fingers crossed for the other 3 chicks hatched at the Sunlife site this year. You can see how reflective the windows are here. Safe on the nest ledge. Excellent but sad blog hon. But you are helping raise awareness on the situation and why we do what we do to help. In the last photo, that is Windward on the left (red band) and I am certain that is Regatta (the fallen) on the right. Euro was out at the time of this shot and Olympia, the youngest, was still in the nest box area. I wasn't there but am sad; as much time I have spent there this watch and was enjoying a lot of Regatta's movements this morning. Knowing each of these birds, and more so daily, its easy to get attached to these little high flyers. I came to visit through Rob's blog. I am very sorry for both your loss, but thank you for your efforts and for raising awareness to this issue. I also got here from Rob's blog. I am so sorry to hear what happened and that you saw it occur; I can image how upsetting it would have been. This is brutal. I used to work at Prudential in Scarborough at McCowan and 401 and those buildings are all glass, except for the newest one. We used to walk around during our breaks and pick up live birds and bring them inside in a box. A lot died but some survived and my friend would release it in her yard a couple of kilometers from the building. They really need to do something about these buildings.